Don't have time for wild, crazy adventures? Find your stride with smaller, personal adventures. I came up with the idea for Adventurus when I was talking to a friend who said she was boring because she didn't go on "big adventures" like me. I thought it was a shame that my friend- a delightful person- thought that. "Adventure" should be something a little different, but a lot of fun. 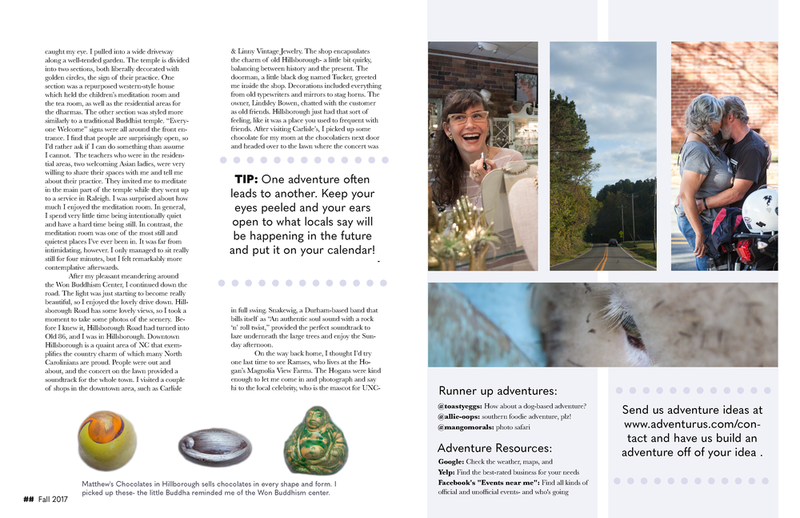 Adventurus is a personal adventure magazine based in North Carolina that recommends adventures based on personality and hobbies. It's goal is to bring a little adventure to everyone. The pages below are part of a recurring column. People send in adventure ideas and then we design an adventure based around the idea.